There have been many three wheeled vehicles over the years and many marques that are all get lumped together under the heading of three-wheelers. A Morgan however is not a three-wheeler; a Morgan, is a Morgan. Owners soon learn to see them as small cars and envious onlookers all want to own one. Of course there are disadvantages to owning and running a Morgan but as they are by far the best of the bunch these disadvantages are somehow much less when the Morgan badge is on the radiator. Henry Frederick Stanley Morgan (or HFS as he came to be known in the motoring world) was the son of a clergyman, HFS was lucky not to be forced to enter the church as a profession. Far from discouraging him, his parents and grandparents gave him every encouragement. He worked as a draughtsman for the Great Western Railway until 1904, when he left and went into partnership with a close friend in a motor and garage business. HFS bought his first car in 1902 at the age of 21, and in 1909, at the age of 28, designed and built his first single-seat three-wheeled experimental car. HFS could never have dreamed that he would become one of the world’s major manufacturers of three wheel cars. His father had put up £3,000 and to open the garage in Malvern and shortly after a second in Fore Street, Worcester. Production at the Morgan Motor Company commenced in 1910. HFS drive and passion meant his company prospered and “HFS” continued to run it until he died at age 77 in 1959. Even today, 2015, the company remains in family hands. In 1911 Morgan displayed their models at the Olympia Motor Exhibition and in 1912 registered as a limited private company with "H.F.S." as managing director and his father as Company chairman. Morgan's fortune really belongs to two influences, the competition, and government road tax laws. In 1913 A Morgan won the inaugural Cyclecar GP at Amiens in France and during WWI Britain's fighter ace hero Albert Ball bought a Morgan and said driving a Morgan was “the closest thing he had found to flying”. 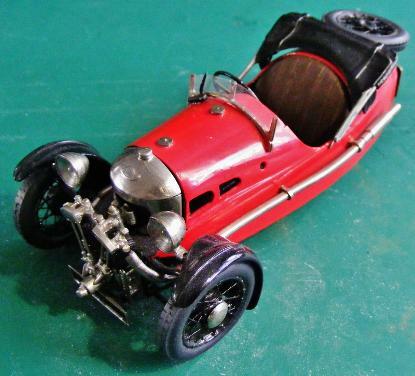 These events led to the naming of the 'Grand Prix' model (1913 to 1926), and Ball's comment being honoured after his death with the use of the name “Aero”. Prior to the 1930s Morgans didn't carry a spare wheel at all. These early Super Sports with the "beetle back" tail are now the most desired Morgans on the market. 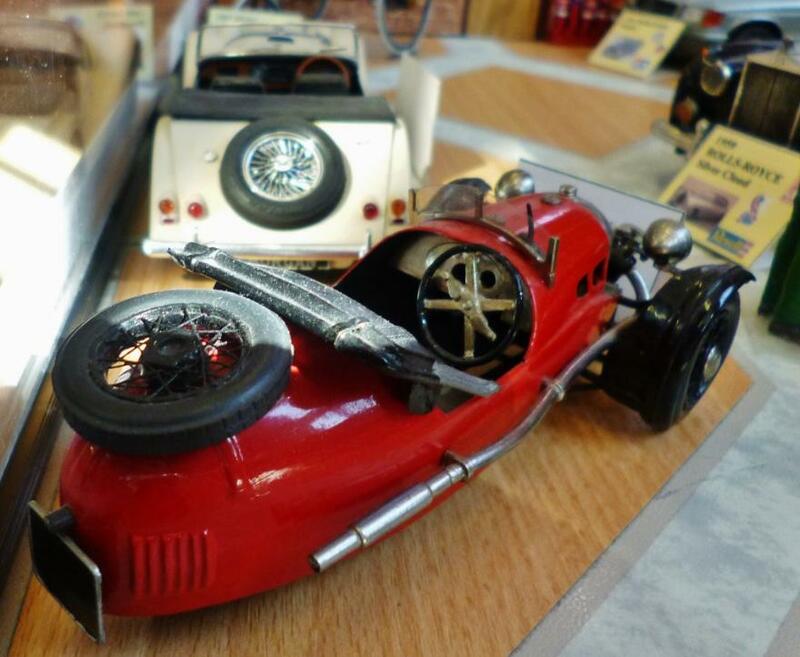 The government Tax relief on small cars also allowed three-wheeled cars to be licensed as motorcycles, with low insurance costs accompanying low road fund licence costs, made the Morgan an affordable car for the younger drivers and small families. Morgans might have run on three wheeled chassis but the variety of bodywork styles was not compromised by this. 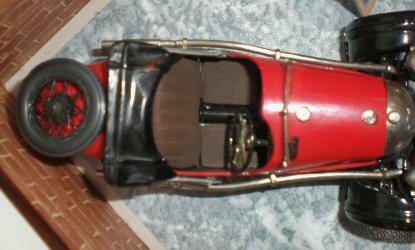 Models ranged from standard fittings to the deluxe versions, 4-seater family models and even a delivery van. The need for a spare wheel to be carried became a bit of a headache for Morgan. At first “the spare” was put on top of the rear deck for ease of access. This took away the much needed luggage space and effectively ruined the lines of the “Beetleback” car. The Morgan Super Sports is low and purposeful, it's low centre of gravity and good handling is aided by the simple front mounting of the JAP, John Alfred Prestwich, engine. The beautifully rounded radiator housing not only houses radiators but helps start the striking lines of the vehicle. The Chassis is a clever design which promotes stiffness while maintaining lightweight. The driveshaft tube forms a central backbone supplemented by tube front subframe which not only mounts the engine but provides a location for the now famous Morgan 'sliding pillar' independent front suspension. The bodywork is built on a light ash wood sub-frame built by hand for each vehicle. 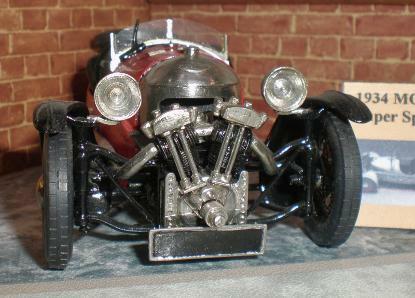 Later models saw Matchless engines up front, with the Matchless M clearly visible but often mistaken for an M for Morgan. The larger models in later years even featured Ford 993cc sidevalve engines. In all cases it is the rear wheel that is driven via a drive shaft. 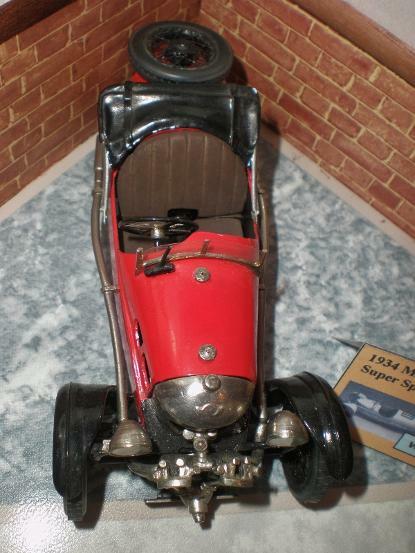 Morgan almost exclusively sold three wheelers between 1908 and 1935 and in most cases these little cars could outperform any normal car of the time. Production of these models slowed after 1940 but remained available in continually upgraded forms until the 1980s. In 2015 Morgan revived the three-wheeler models for a new type of customer, but priced at £31K is no longer the “cheap” end of the car market. 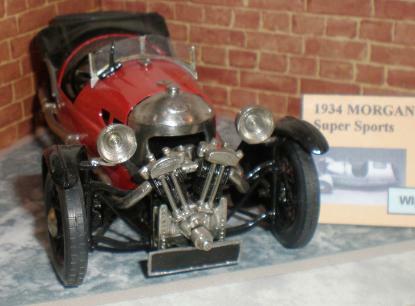 This model was donated by our friend Mick Slack. It was refurbished by Rod, which entailed stripping it back down to bare metal and totally rebuilt. 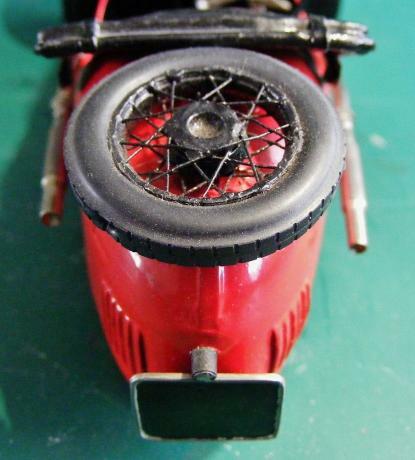 Information on restoring old models can be found in our Articles and Projects pages. South Eastern Finecast still have these kits for sale and for a kit that was originally designed in the late 1950s it is a very good representation of the famous car. It was a "Wills" kit to start with and any of these in the original boxings are worth a lot of money. South Eastern Finecast took over the Wills range in 1988 and have added some items as well as renovating and updating the old car (and locomotive) kits. This model has been spraypainted with Halfords paints backed up by Revell and Citadel acrylic paints, inks and washes.